The recent serial blasts have cast a grim shadow over the city as it prepares for the festivities of Ramzan and Ganesh Chaturthi. Never in the past was the security as tight and visible as it is now. 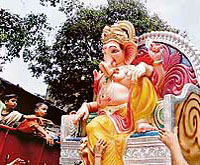 The Ganesh Chaturthi festivities in Maharashtra were marred by stray incidents of violence in some parts of the state, the central police control room said. A high level marathon meeting of senior administrative and police officials chaired by Chief Minister Nitish Kumar today decided to impose a collective fine of Rs 5,000 on villagers for any future attempt by them to take up law into their own hands to punish criminals in the name of instant street justice. One of the most wanted leader of the proscribed ULFA and a mastermind of carnage of Hindi-speaking people in eastern Assam in January last was shot dead by a joint team of the police and Army at Pokabam village, under the Panitola police station, Tinsukia district, today. The RJD, a key UPA ally, today favoured reservation for Dalits among Muslims and other minority communities and 10 per cent quota for the poor among the upper castes in an apparent effort to enlarge its vote bank amid talks of an early election. Prime Minister Manmohan Singh underwent surgery of the prostate gland at the All India Institute of Medical Sciences here today. Opening a can of worms, a recently retired Andhra Pradesh vigilance commissioner R. C. Samal has made sensational corruption charges against several bureaucrats and politicians and set off ripples in political circles. A couple and their son, an engineering student, were buried alive by a landslide triggered by a heavy downpour in the wee hours today at Salbari area in Guwahati. “It’s always nature. Nature is where I start from and is the inspiring force behind my paintings. 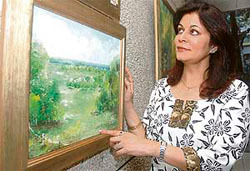 These canvases are really reflections of my coexistence with nature or really our silent unity with nature and the divine,” says Kajol Nalwa enthusiastically as she talks about her latest series on display at the Habitat Center here. The exhibition titled, “Expressions”, is on till September 18. Lilliputian combat aircraft and ships. The recent serial blasts have cast a grim shadow over the city as it prepares for the festivities of Ramzan and Ganesh Chaturthi. Never in the past was the security as tight and visible as it is now. A thick security blanket has been thrown around the twin cities with the deployment of 15,000 police personnel, surveillance cameras and modern equipment to detect explosives. "We already have 12,000 policemen deployed and another 3,000 are being drafted from the districts as part of security arrangements," the city police commissioner Balwinder Singh said. The Muslim holy month of Ramzan began today, with memories of blast at the historic Mecca Masjid here still fresh in the public memory, while the 10-day Ganesh Chaturthi festival will commence tomorrow. The twin festivals have kept the police on tenterhooks. In the backdrop of the August 25 twin bombings at Lumbini Park and Gokul Chat Bhandar, that claimed 43 lives, the city is in the grip of fear with the sight of any unclaimed or suspicious objects sending the people in a tizzy. Personnel of the paramilitary Rapid Action Force and Central Reserve Police Force are being deployed and 30 special teams have already been constituted with modern equipment to detect any kind of explosives at public places. Vigil has been stepped up in the communally sensitive areas of the city which have a long history of riots. As many as 18 watch towers, each about 20 ft high, are being erected to keep a round-the-clock vigil in sensitive areas. The city has been in a state of alert in the wake of serial blasts and the reports of terrorist operatives lurking in the city with their consignment of smuggled RDX have further added to the tension. The city had witnessed the worst communal violence in 1990 when 200 people lost their lives. There were at least three incidents of violence pertaining mainly to supply of power to the pandals meant for celebrations in different parts of Maharashtra, police said. With Maharashtra facing a severe power shortage, the Maharashtra State Electricity Distribution Company Limited (MSEDCL) has been unable to supply power to all the pandals in the state, officials said. Angered at this, organisers of the Ganesh Chaturthi festivities, mainly politicians, have taken to assaulting employees of the power utility. “Several employees have been beaten up across the state,” the MSEDCL employees' union representatives said. In Palghar, just outside Mumbai, the engineer on duty at a power station was beaten up after he refused a written undertaking for uninterrupted supply to some protestors. The engineer has now been admitted to hospital in a critical state. The MSEDCL has now offered temporary power connections to Ganapati mandals at a concession. However, officials have advised organisers to make their own arrangements of power, mainly via mobile generators. However, such generators are expensive as compared to power from the utility. The meeting at the Chief Minister’s official residence at Aney Marg was held in the wake of the recent spurt in cases of street justice in many places in the state, including the shocking lynching of 10 suspected thieves by a mob of about 300 in Vaishali on Thursday. Nitish has already ordered a CID probe into the Vaishali incident. The police managed to rescue one thief of the total 11, who is now battling for life at the Patna Medical College and Hospital in a critical condition. Talking to mediapersons here today after the meeting, state home secretary Afzal Amanullah said prima facie there could be be administrative lapses on the part of the local officer in charge, inspector and DSP leading to the lynching of 10 persons. “We will wait for the report by IG (HQ) Anil Sinha on alleged administrative lapses leading to the brutal killings before taking necessary actions against the erring officials”, he said. An FIR was already registered against 300 odd unknown persons in connection with the incident. Sources disclosed that at the meeting Nitish expressed anguish over the sudden spurt in the incidents of street justice, which apparently raised doubts about the credibility of his government in delivering the promised good governance. He was reportedly also upset over the alleged apathy of the local police to take note of complaints of the people regarding frequent thefts at Dhelpurwa village that led to the shocking incident of street justice on Thursday. While the CID probe began yesterday, Nitish asked the additional director general of CID Yashwant Malhotra to camp at the site along with forensic experts. He set four days deadline for Malhotra to submit a detailed report to him on the incident that invited widespread criticism of his government. The desperation on part of Nitish to refurbish the image of the police was linked to the criticism by his political opponents claiming “jungle raj” in Bihar under his rule. Besides, the chief secretary and Home secretary, DGP, ADGP, zonal IGs and other senior officials attended the emergency meeting convened by Nitish to discuss remedial measures in the wake of Vaishali lynching case. The meeting also decided to transfer all those officers from respective police stations and districts who were posted there for more than two years. Tinsukia district SP Prasanta Kumar Bhuyan told The Tribune that the slain militant was identified as self-styled captain Amar Tanti, a member of the ULFA’s most active 28th battalion that operates mainly in eastern Assam districts bordering Arunachal Pradesh and Nagaland. “Acting on a specific information, a joint team of the police and Army zeroed in on the hideout of the militant who tried to flee by hurling a grenade at the men in uniform on his trail. He was shot dead while he was trying to flee,” the police official said. The killed militant was responsible for triggering a number of recent bomb explosions in Tinsukia district. He was also one of the masterminds behind the carnage of Hindi-speaking people in Dibrugarh district in January this year. Security sources claimed that killing of the militant would serve a major setback to ULFA operations in eastern Assam areas given that he was overseeing the outfits operations and extortion drives in Tinsukia and Dibrugarh districts. The security forces have been keeping constant pressure on the banned ULFA in its eastern Assam bastion of late. Though RJD chief Lalu Prasad Yadav brushed aside the possibility of an imminent mid-term poll, he told reporters at the end of the party’s national executive meeting here that though no MP would want an early election, his party was always ready to face the electorate. "His health is fine. There is nothing to worry," the Prime Minister's media adviser Sanjaya Baru told mediapersons. The Prime Minister's office said the “trans urethral resection of the prostate gland was performed to treat benign prostatic hypertrophy of the prostate or benign enlargement of the prostate gland”. The surgery was performed by a team of doctors led by Prof N.P.Gupta, head of the department of urology. The Prime Minister has had a stable post-operative course. He will return home on Monday. He was admitted at 6 am and the surgery lasted till 9 am. President Pratibha Patil talked to him on phone. Samal, an IAS officer who retired last week, accused Chief Minister's Office (CMO) and home minister K. Jana Reddy of "harbouring and protecting corrupt bureaucrats" and named 18 IAS, IPS and IFS officials, including a former DGP, for indulging in corrupt practices. In his 56-page note submitted to chief secretary J. Harinarayana and released to media yesterday, the official said he was deeply pained over inaction, though he had brought to the notice of the CMO several instances of corruption. He said he was not given a free hand to proceed against corrupt officials and the dismal performance of the Anti-Corruption Bureau (ACB) has reached its zenith and is virtually defunct. The former vigilance chief named several key departments, including irrigation, panchayatraj, rural development, transport and agriculture, as "cesspools of corruption" and charged the CMO with "shielding unscrupulous elements". He said he wanted to post names of the corrupt officers on the Vigilance Commission website but the government rejected his proposal and, hence, he decided to release his report soon after his retirement. However, the home minister flatly denied the charges and said they were aimed at defaming the government. The main opposition TDP said Samal's disclosures only "mirrored the sorry state of affairs" and vindicated its stand that the Congress government was steeped in corruption. Those killed were identified as Hemanta Sharma, a State Industry Department employee and his wife Anjali Sharma. Their son Anuraj Sharma, who also died, was a second semester student of Assam Engineering Institute. The youngest son of the couple, Tusharraj Sharma had a miraculous escape. Police said that all the family members were sleeping when a huge volume of mud fell on their house located in a hilly area and buried all of them alive. The landslide caused damage to a few more houses in the locality. An official in Kamrup district administration said the area was prone to landslides during the rainy season because of rampant destruction of the green cover uphill by the encroachers who have ignored repeated warnings issued by the administration and declined to shift from the area despite the danger. Meanwhile, flash floods triggered the downpour inundated several localities including arterial roads, throwing normal life out of gear. Students and office-goers were stranded on their way for several hours, as vehicular traffic was totally disrupted in most parts of the city. “Divine Footprints” shows golden light filters thrown beatifically from a golden yellow landscape. A rather subtle Ganeshji hovers on one side of the canvas, blessing it and surreal lotuses bloom on a silent landscape. Kajol is articulate in describing her work. “Divine influence is all around us, but we don’t always see it. This canvas really depicts divine footprints of God and I have used Ganeshji as a symbol of this.” Kajol feels that her work is evolving, as she goes along new influences. For instance, take the red sea-scapes. They are really my experiment with abstract art and are completely different from the work I have done so far. Kajol’s red sea-scapes are done in fiery hues and catch your attention. The red sea and sky are evocative of Martian landscape. In this exhibition, Kajol has done a series of “Harmony” paintings focusing on the female element against emptiness, bringing a charged female energy into her collection. Over the past two years, Kajol has exhibited in London and Mumbai, besides New Delhi. She has also exhibited at Chandigarh and Canada.